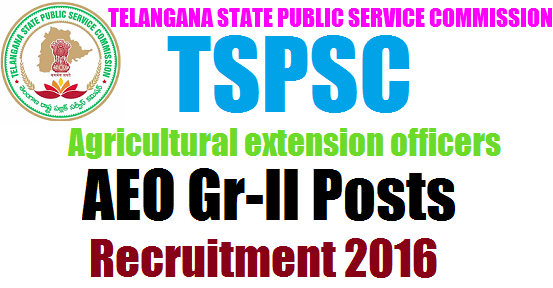 TSPSC AEO/Agricultural extension officers Recruitment 2016 - Telangana Govt GO.77, Telangana State Government has accorded permission to fill 98 vacancies of Agriculture Extension Officer (AEO) Grade-II through direct recruitment by Telangana State Public Service Commission(TSPSC). In this post, TSPSC AEO posts details, Age limit, educational qualification, how to apply, application fee, online application form, last date for applying, exam date and examination pattern are given here.The Telangana State Public Service Commission shall issue schedule for recruitment soon. In the reference second read above, the Agriculture & Cooperation Department have furnished proposals for filling (98) vacancies in the category of Agriculture Extension Officer Grade-II by direct recruitment through the Telangana State Public Service Commission, Hyderabad. 2. After careful examination of the proposals furnished by the Department and keeping in view the actual requirement of manpower with reference to the nature of work and activities of the department and also the overall financial implications, Government hereby accord permission to fill (98) vacancies of Agriculture Extension Officer Grade-II through direct recruitment by Telangana State Public Service Commission. 3. The Secretary, Telangana State Public Service Commission shall take appropriate steps for filling up of the above vacancies through direct recruitment by obtaining the details, such as local cadres of the vacancies as per the Presidential Order (zone/ district etc.,), roster points, qualifications, etc., from the concerned authorities. The Telangana State Public Service Commission shall issue schedule for recruitment expeditiously and issue notification accordingly. 4. The Agriculture & Cooperation Department and Head of the department concerned shall furnish details of all vacant posts authorized in this order, including the local cadre wise vacancy position, roster points and qualifications, etc., to the recruiting agency immediately under intimation to Finance Department. The Department shall issue necessary amendments to their service rules / Government Orders changing the existing recruitment procedure /recruiting agency wherever necessary. 5. All concerned are hereby instructed to take immediate action to implement these orders.